Wednesday, April 24Delhi Greens Blog: Greening the World, One Post at a Time! 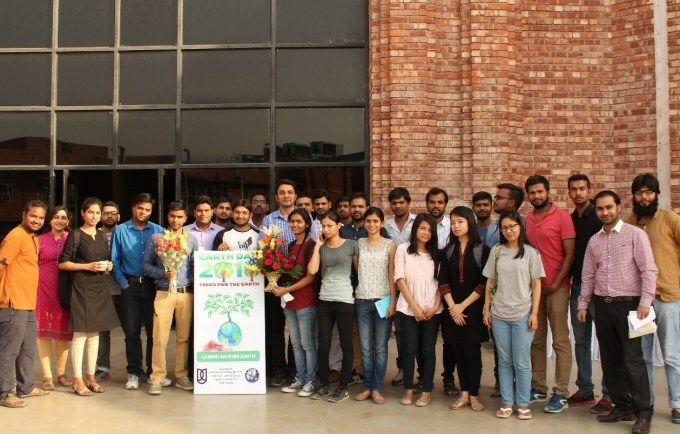 The Eco Club of the School of Environmental Sciences (SES), Jawaharlal Nehru University (JNU) celebrated the Earth Day 2016 with a university level event bringing together all researchers working to address global environmental concerns. The theme for Earth Year 2016 was Trees for the Earth. The Eco Club of SES, JUN celebrated the Earth Day on 22 April 2016 with this event. The aim was to provide a common platform for all individuals who are directly or indirectly involved in nurturing our dear Mother Earth. This was the first event of the Eco Club of SES, JNU at the university level. Despite this, the event saw wide participation of students from different areas of study and was successfully able to integrate them for the common cause. Distinguished speakers from diverse fields, working with a focus to address environmental issues, were invited. The Earth Day Celebrations was a two day event starting on 21 April 2016. On the first day, interactive activities such as audio-visual quiz, essay and creative writing, debate, painting and cartoon drawing competition took place. All these interactive activities were themed around environmental issues and were organized throughout the day. Students from different Schools/Centres in JNU participated and also won competitions in these activities. At the same time, their refreshing thoughts also instilled new perspectives among all participants. The first day concluded with a Green Run. The Green Run started from Sabarmati Dhaba, circling the internal Ring Road via Administrative Block and back to Sabarmati Dhaba. It was a small initiative towards directing people to Go Green in their daily lives. The second day began with lighting of the lamp by Sri Jairam Ramesh, former Environment Minister of India and Chief Guest of the event along with Prof. A. P. Dimri, Coordinator of the Event and Prof. P. K. Joshi. The speakers from different strata of the society, who have made valuable efforts towards environment conservation, were invited for the day. 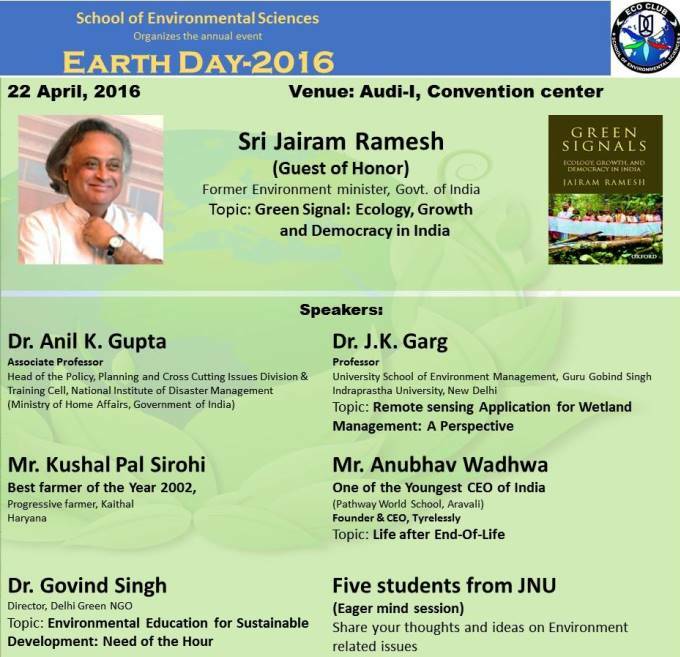 Sri Jairam Ramesh delivered a lecture on his recent published book “Green Signals: Ecology, Growth, and Democracy in India”. He shared his integrated knowledge on environment and Government’s policies. Anubhav Wadhwa, one of the youngest CEO’s of India, talked about Tyrelessly, an environmentally compliant End-of-Life Tyre collection and disposal service and inspired us to take steps no matter how small. Second half of the day started with validation of paintings and photography exhibition by Dr. Surya Prakash, Technical officer and renowned Ornithologist, SLS, JNU and Mr. Anubhav Wadwa. This was followed by interactive talks delivered by Prof. J.K. Garg, GGSIPU, who talked about application of remote sensing for wetland management; Dr. Anil K. Gupta, Head of the Policy, Planning and Cross Cutting Issues Division & Training Cell of National Institute of Disaster Management and Dr. Govind Singh, Director of Delhi Greens NGO. Following these interactive talks, prizes were distributed to the winners of the various competitions by the Dean of the School of Environmental Sciences, JNU. The ceremony concluded with a Vote of Thanks from Chadrashekhar Azad V., Convener of School of Environmental Sciences. The involvement of students from different backgrounds clearly showed that the need to raise awareness about environmental issues is well understood by all. The speakers, who were invited from different fields, imparted their knowledge and shared their experiences which helped in developing a diversified view and stimulated the torch of ideas in the minds of all participants. This report has been submitted by Chadrashekhar Azad V. of SES, JNU. He can be contacted at the following email address: ajadshekhar@gmail.com.